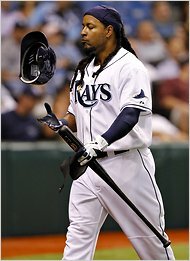 After what was a bitter end to his fantastic career, Manny Ramirez is officially returning to Major League Baseball. Ramirez, who led the Boston Red Sox to two World Series titles and was a star player for the Cleveland Indians and the Los Angeles Dodgers, has signed a minor league deal with the Oakland A’s and is not going to make any more than $500,000 for the season. It was just a few years ago that Ramirez was making $20 million a year and felt as though he was being underpaid. Before his abrupt retirement, Ramirez failed a drug test and tested positive for performance enhancing drugs. Because he left before serving his suspension, Ramirez cannot report to Oakland until 50 games have been played. Originally, Ramirez was supposed to serve 100 games, but because he retired and ended up missing over 140 games last year, MLB officials have decided to allow for the lost time last season to count as part of his suspension. Ramirez is hoping to make the major league roster come summer time and add on to his 555 career home runs and prove that he is still the great hitter he has been in the last 20 seasons.